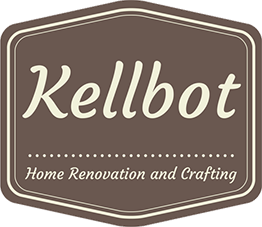 New Sewing Machine - Kellbot! | Kellbot! I picked up a new sewing machine from shopgoodwill.com. It was sort of an accident. A friend linked to a knitting machine for sale (cheap!) and I noticed they have a ton of old sewing machines. Most of them are junk but a few are just solid old machines in need of love. I have two other machines in addition to the one I just purchased, the younger of which is approaching 70. Both work flawlessly. But every now and then I have a need for a zig-zag stitch, and neither machine can do that. 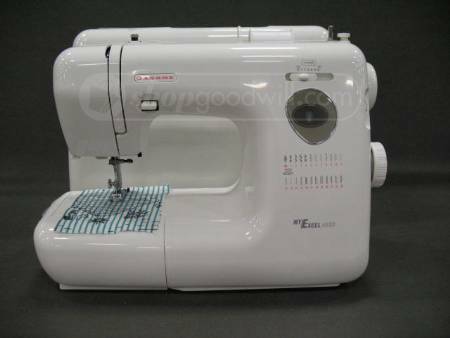 While poking around the Goodwill website I saw a Janome My Excel 4023 for sale. It’s description merely said “works.” I couldn’t find much information about the particular model but I figured for under $50 it was worth a gamble. 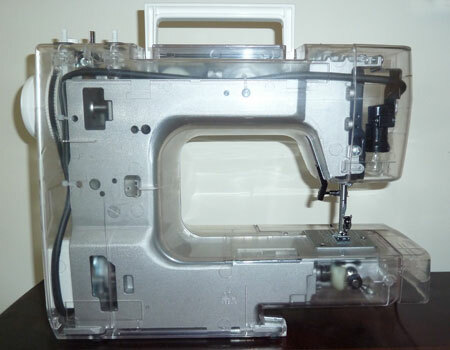 Even the low end Janome machines are made with metal frames (and then covered in plastic for aesthetics), so as long as the machine was in decent shape it would suit my limited needs. $37 later the machine was mine. Goodwill of Indiana did a thorough job packing it up, and sent it along with a scrap of cloth, spool of thread, and full bobbin loaded up and ready to go. I plugged it in, turned it on, and realized I had no idea what half the knobs did. The machine didn’t come with a manual and I couldn’t find one online. So I did the unthinkable: I contacted Janome customer support. 15 minutes later, a PDF instruction manual landed in my inbox. Magic! Some less than scrupulous companies are selling digital copies of the PDF, despite it being freely available from Janome. If you are looking for a copy you can download the Janome My Excel 4023 for free. It’s an all-mechanical machine. Each of the 24 stitch patterns has a little metal disc with grooves for the needle positioning. I did a test swatch of each pattern on some scrap felt. 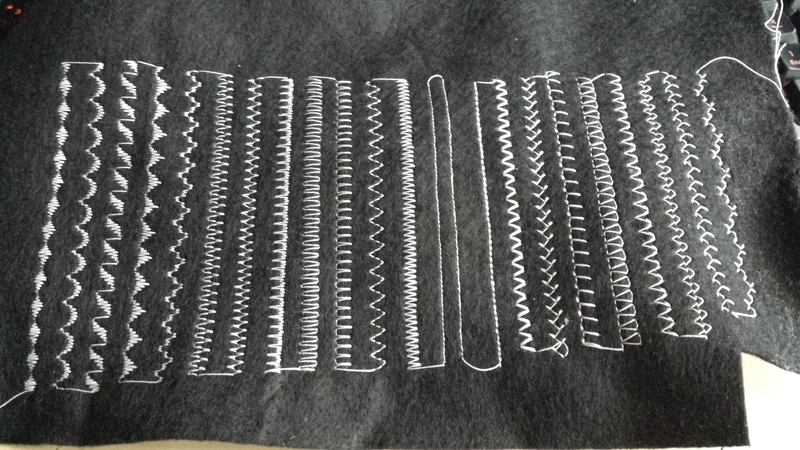 A swatch of all the different stitch patterns on the machine. After a quick cleaning everything looks to be in good shape. The My Excel line was made in the 90s, so I’m guessing this machine is 15 years old, and is in incredible shape given that. It barely looks used and could probably use a professional once-over, but for $37 I feel like I got a really good deal. I have a janome excel 4023 which I bought 17 years ago. It has been well used and is still going strong. Never had any problems with it. Love this machine, if I ever do change it I would get another janome. I also have the 4023 I love this machine had no problems and it must be well over 30 years old looks like new too, over the past few years I’ve added more snap on feet to my collection bought a generic Walking foot works a dream, even used a twin needle, now that I’ve retired I have more time to play around and discover just what this machine can do. You certainly got a bargain! I have 4023 it’s 20 years old and marvellous. but I have mislaid my manual…can’t find a PDF in UK if you can could you possibly email a copy to me if its not too much trouble ?. Would be most appreciated! I have successfully downloaded your PDF thank you ..great of you to put it online….happy sewing!